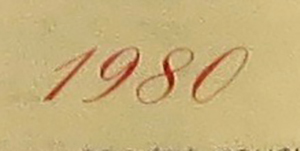 A real old and drinkable wine from 1980. Every wine lover is fascinated by a perfectly aged and rare red wine with a world-famous origin. We offer exclusively original and unaltered wines from 1980 in their unique bottle with original label and cork. You are choosing a first-class wine harvested in 1980 in one of the best French and Italian wineries.